Technology is a terrific tool, when used well. But when it fails, it fails miserably. Look, if you’re going to stand up there and just read the slides word for word, you should have emailed me the deck. I could have stayed home in my pajamas to read them! While this one speaker was setting up, it was clear from the screen that his presentation had 317 slides. The person next to me let out an audible groan. THREE HUNDRED AND SEVENTEEN FREAKIN’ SLIDES!!! IS HE OUT OF HIS MIND!!! I’VE GOT TO GET OUT OF HERE!!! Off to a great start already. I pride myself on knowing what it’s like to have been a PowerPoint casualty, and not to inflict the same torture on anyone else. 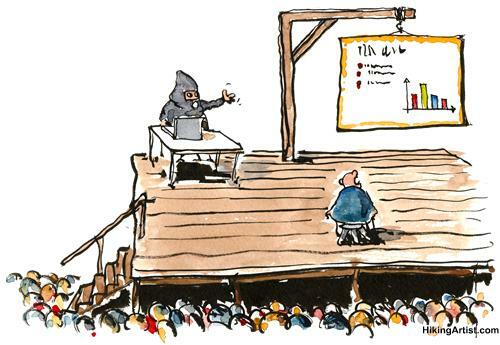 However, last week, I encountered a whole new version of this malady: insanity by PowerPoint. While leading a group of 800 people in an interactive program, I was speaking to one idea when my slide deck suddenly lurched forward. Knowing the audience would react more to behavior on my part than the slide, I ignored it, and worked to transition smoothly. Problem solved. About a minute later, I was on the next idea when the slide deck went back one slide, then another. Strange….my clicker only allowed me to advance slides, not reverse them. This time, I made a joke about a ghost of PowerPoints past that had come to haunt us. It wasn’t great, but it was the best I could come up with in the moment, and it got us back on board. In the meantime, I could see my Audio/Visual coordinator freaking out in the back of the room. She knew I couldn’t reverse slides. I knew I couldn’t reverse slides. She scrambled to the A/V table and the PowerPoint operator. I could see a heated discussion going on, even though I was a good 60 yards away. I managed to get the group to discuss a question at the tables. This bought me a few minutes of time to figure out what was happening. While I walked off the stage to head to the back A/V table, I noticed the slides lurch forward, and then back again. I hadn’t touched a thing. Right about then, it hit me. What if someone else had a remote clicker on the same channel? Who else is on the AV team? It turns out that another member of the A/V team had a remote in her pocket, and hadn’t realized it was there. As she walked around the room, she was (inadvertently) moving the slides around. Who’d have dreamed that one up? Sometimes all of your professionalism and preparation go out the window with a single click of a remote. Next time, we’ll do a remote check before we start. What contingency haven’t you planned for?